Welcome to our Call to Artists Gallery! Here you can find all the works inspired by the Garden from our on-going Call to Artists. If you're interested in participating, please see our flyer. Kicking off this year’s Call to Artists is the amazing Rossitza Skortcheva Donesky ! Our latest Call to Artists work is a sketch by NYC-based illustrator Marcellus Hall. This week's Call to Artists work is a watercolor painting by Bethany Lee. Our latest Call to Artists piece is a painting by Garden supporter, Nick Low. This piece was featured in our first Call to Artist show. This week's Call to Artists is an installation by Megan Olson titled Moss Garden from the 2007 Maxwell Davidson Gallery show, Urban Nature. "I lived in the neighborhood for a few years on Mott St., and was so inspired by the Elizabeth Street Garden. In fact the entire show was conceived and executed while I lived in the neighborhood, and I believe a great amount of the inspiration is owed to Allan Reiver and the beautiful garden. He has created a wonderful sense of nature within an urban landscape, not typical of a park, but rather, a lovely estate with statues and antiques. There is no other place like it. Elizabeth Street Garden is a sanctuary and place of reflection for countless people who live in the neighborhood, myself included." 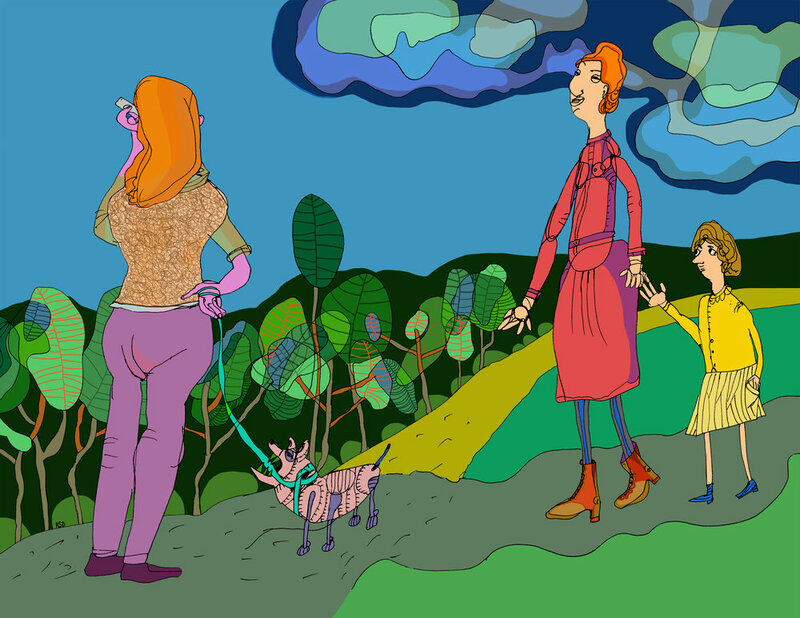 The latest work from our Call to Artists is an ink with digital coloring piece by Eleanor Doughty. This week we have a collection of drawings from the local P.S. 1 students. 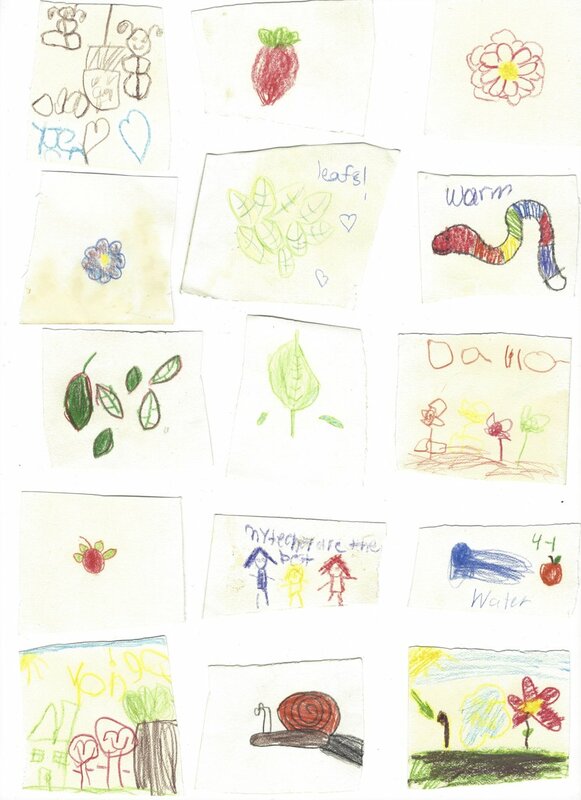 These drawings were made during a field trip to the Garden for a series of composting workshops in collaboration with the Lower East Side Ecology Center & Common Ground Compost. Over the past three months the students have visited the Garden to learn about planting seeds and making their own compost bins using worms and other natural materials found around the Garden. This week's work is a manifesto written and recorded by Flavia Bertorello, inspired by one of her visits to the Garden. This piece was featured in our first Call to Artist show. Our first Call to Artists show was a magical experience! A special thanks to all of the wonderful artists who submitted work, came to the show, and shared the stories of your pieces. The Call is NOT over, and there are more shows to come! If you want to submit your work, please follow the instructions at the top of this page. This week's work from our Call to Artists, are three paintings by artist and Garden supporter, Bill Rabinovitch. Titled Elizabeth Street Garden Figure (5/9/17), Untitled inspired by the Garden (5/15/17), and Meditation on Beauty in Elizabeth Street Garden (2017), respectively. 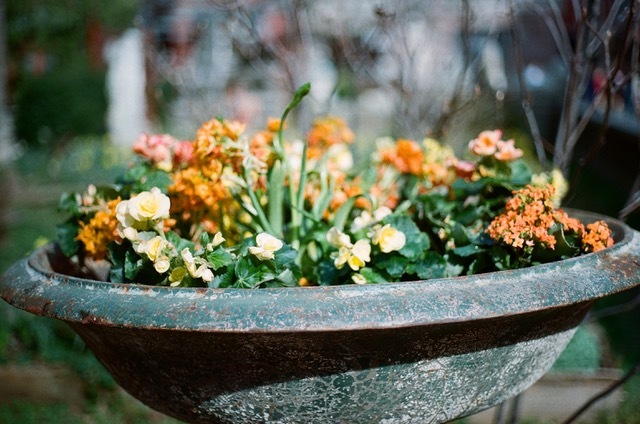 This week's work is a pair of 35mm film photographs taken in the beginning of Spring by photographer Nicole Torres. The latest work from our Call to Artists is a piece by 12 year old Garden volunteer & artist, Ava Yang. This week's work is a poem written by Garden supporter Jake Dietrich. "Every time I go I feel surrounded by so much creative energy. I like to think that the power of all the great minds who gather here help nourish and grow the ideas that are but seeds inside of my mind. To me, it's like a think tank for the artist. My poem tries to illustrate this." This week's work is a collection of mixed-media (inks, acrylics, and collage materials) by Garden volunteer, Raji Jagadeesan. These pieces were inspired by the Garden during Spring. This week's work from our Call to Artists is a watercolor painting by Elizabeth Street Garden supporter Hideko Rostad. This week's work from our Call to Artists are three photographs by local photographer, Luigerman. "A magical place in the middle of my jungle, to be aware and reflect our nature and dreams." Our first work for the Call to Artists is a painting coupled with a poem, written and performed by the artist and our neighbor, Kim Kalesti.